For the Northern Hemisphere (primarily the Arctic), observations using remote sensing technologies have been used to measure the extent and the to assess the development. Despite considerable year-to-year variability, significant negative trends are apparent in both maximum and minimum ice extents, with a rate of decrease of -2.9% per decade for March and -10.5% per decade for September (linear least squares reqression). The differences in extent are calculated as anomalies compared to the 1979-2000 average, which was 7.0 million sqkm2 either sq or 2 but not both, here and elsewhere in September, and 15 million sqkm2 in March. 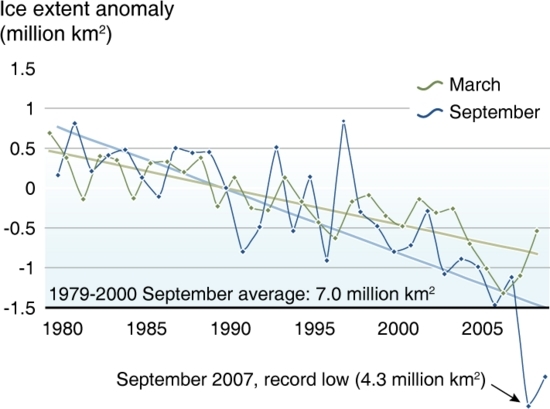 September 2007 presented a record low extent, with only 4.3 million sq km2, an indication of ongoing climate change. 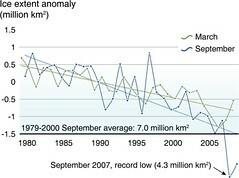 Please note that this figure was not originally published in Global Outlook for Ice and Snow, but is updated from a figure in that publication.